On October 12-14, Tsaghkadzor hosted the 4th annual Rainbow Forum. This time the event was the largest in number of participants, 64 people took part in it. Not only LGBTQ (lesbian, gay, bisexual, trans, queer) people attended the event, but also the allies. This year the forum was unique because of the fact that LGBTQ people’s parents participated in the discussions for the first time. There were also health specialists and doctors, scientists, artists, journalists, lawyers, political and public figures, activists and other professionals. 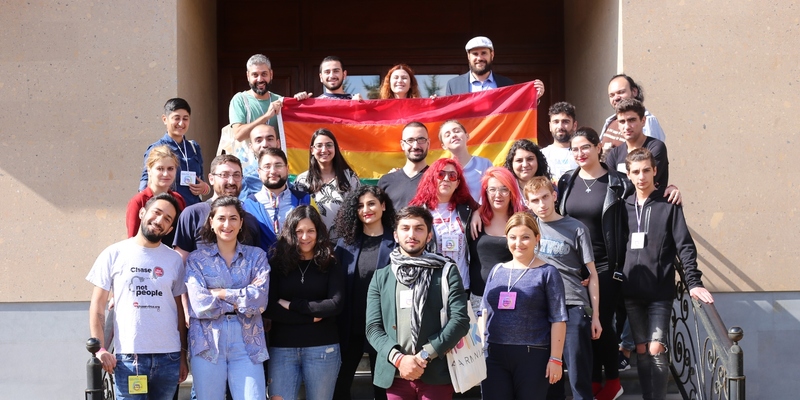 Within 2 days, topics about LGBTQ people and politics were discussed: which is their role in that field and how political parties manipulate LGBTQ issues for their own interests and how to resist it. The LGBTQ community’s regional development topic was covered, also the topics on the crossing paths of the feminist and the LGBTQ movements. Health issues were discussed, such as HIV-related and public health policy issues, as well as problems in the medical and psychological field. There was a separate meeting with parents, who told them about the difficulties they had to overcome, but eventually they were able to accept their children.